Sharing two members of under-appreciated Polish black metallers Mgła (here joined by Hate guitarist Destroyer) Kriegsmaschine are much more than a mere side-project. 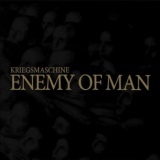 Enemy of Man is their second album and it's a wonderful slice of misanthropic bile, thickly atmospheric yet instrumentally superior, taking pages from both traditional black metal and the more leftfield likes of Deathspell Omega. It's the Frenchmen that you'll be thinking of mainly after hearing opening track None Shall See Redemption, which builds slowly into a powerful dirge, a slab of droning noise backed up by technical and complex drumming and Destroyer's snarled vocals. Kriegsmaschine are less deliberately weird and much less avant-garde, but make black metal that's all about the experience, a ritual of unsettling Satanic noise. What truly impresses me about Enemy of Man is how the band indulge their progressive tendencies without at all damaging the atmospheric effect. The pulsing guitar riffs that introduce Lies of the Fathers change as the track progresses, enveloping the drumming and making for a disturbing morass that drags you deeper with every listen. There's a moment where the other instruments fade out and they allow the strange riffs to take dominance above echoing cymbal taps, almost slipping into doom before resuming the surrounding harshness – it reminded me of the late lamented Altar of Plagues' final sound, albeit twisted into a form far more purely black metal. Elsewhere, the howling chaos of Farewell to Grace is particularly Blut Aus Nord-y, growing stronger and more strident as the drums grow in confidence. Darkside's performance on the drumstool is a strong one; he's never content to stay distant and blasting away hypnotically, but is upfront and confronting the guitars for primacy, an effect I've always loved in black metal for the wonderful life it brings to the music. Tracks generally being long, seven-to-eight-minute epics, this is really is music that needs time, but quickly envelopes you when allowed to. Thanks to strong writing, it always holds your attention, too; the swirling, almost tribal drumming of Asceticism and Passion is an intriguing step leftfield, for example, as is the slightly more aggressive vibe of closing pounder To Ashen Havens, where the drumming really goes for the throat. If there's one negative, it does feel that the band are repeating themselves here by going over more or less the same ground on every track – the title track suffers from this especially. And the album does end rather abruptly, leaving you wanting more. Still, is that really a negative? It's genuinely difficult to criticise Enemy of Man for its faults, as there are few. Those awaiting a new Deathspell Omega opus will find much to like here, as will Mgła devotees.